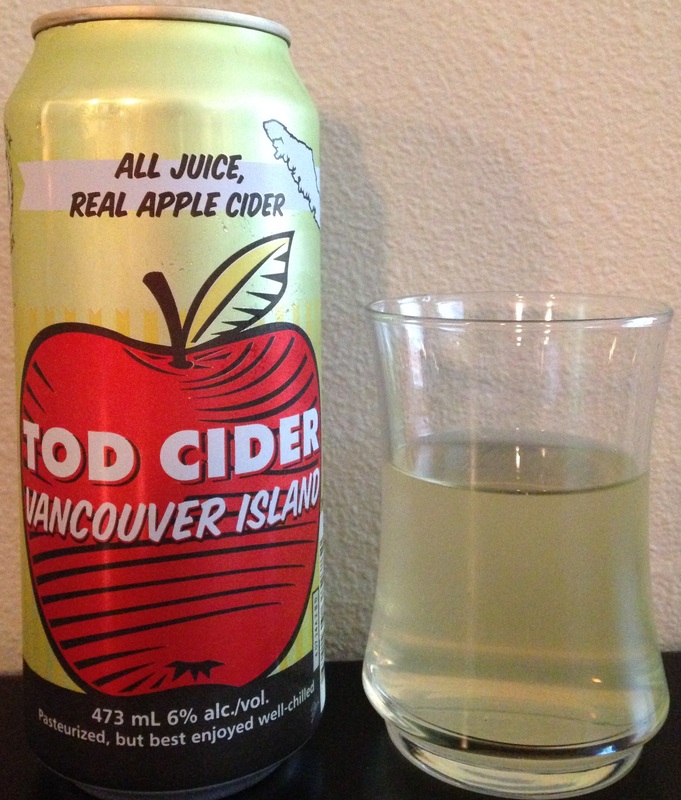 Review of Tod Cider Vancouver Island from Tod Creek Craft Cider. The only other Canadian cider I’ve had that I can think of is Sea Cider. Thanks to Ron from DrinkingCider.com for bringing me two ciders from Tod Creek from his Vancouver detour to his Cider Summit / WA Cider Week trip! Availability: Vancouver Island, Vancouver, and a couple store in the interior of British Columbia. They are entering their second season, and have plans to expand into the Kelowna area, possibly Alberta, and hopefully eventually the U.S.
Cider Description: Our craft cider in a can! This is all juice, and not watered down like all the big boys do. Refreshing, clean Canadian cider with a hint of tartness. Cidery Description: Tod Creek Craft Cider makes small batch, handcrafted cider with BC apples. We source our apples from local trees on Vancouver Island as well as from farmers in the BC interior. Long, slow fermentation brings about great flavours in the traditional way. We typically ferment each batch for about four months. If you want the super-sweet, watered-down canned stuff, we can’t help you. Our ciders are all-juice blends to bring a clean, crisp, enjoyable drink that goes great with dinner, friends, or all by itself. As a small batch cider, you’ll notice that each year the ciders will vary slightly, much like a good wine does. Our apples will be influenced by the sun, the amount of rainfall, and other factors, so each year will yield a slightly different taste. Most of our ciders are coarse filtered, and our hopped cider isn’t filtered at all. Filtering can take some of the flavours out of cider, so we try to limit the amount of filtering we do. Additional information I obtained from Tod Creek: This canned cider variety is made from mostly dessert apples (Golden, Granny, Sparton, Macintosh, and Jona), but their bottled ciders have more apple variety, including crabapples. They opened in June 2014 and have a micro-cidery setup, their own orchard in Victoria, and lease an orchard in Kelowna. A tasting room is in the works (hoping for Summer 2016), but they will do a tasting & tour by appointment. Sea Cider and Merridale are also in the same area. I commented I noticed a higher carbonation level and enjoyed it, but cidermaker/owner Chris Schmidt says their canned cider is carbonated to the minimal levels for Aluminum cans, a target of 2.4 atm, and their bottled cider is also lower carbonation. So, I’m curious why I perceived different. Maybe read my review and see what you readers think? I’m guessing if anything its the citrus notes which made it seem more fizzy. How Found: Ron gave it to me. I’d never heard of Tod Creek cider before as it isn’t available here in the Seattle area. First Impression: Light lemonade yellow, slightly hazy. HIgh carbonation upon pouring. Smells of citrus, yeast, and apples of course. Opinion: On the sweeter side of semi-dry. Moderate acidity and tartness. Mild bitterness and tannins. Flavor is quite citrus-forward. Some yeast, pear, and floral notes. Slight funk and earthiness. Light bodied. Moderate carbonation. Quick finish. A refreshing and easy to drink cider. More complexity than I expected. The only negative I have is that it seemed slightly on the watery side, but they only used fresh pressed juice; sometimes it just ends up that way. Most Similar to: Nothing I’ve had. Its still pretty dissimilar from Spanish Sidra, which probably typically has the most citrus notes of any type of cider. Seattle Cider kinda came to mind, but not really. Closing Notes: This is probably my favorite canned craft cider so far, and possibly one of my favorite flagship ciders. I think I like the citrus notes and higher carbonation the best. I usually don’t like significant tartness, but it worked well in this case. It doesn’t however seen to be as well-received online. I really want to try their Breakwater Vanilla (Cider with Maple Syrup & Vanilla), as that sounds awesome! I also have Tod Creek’s hopped cider, but I’m not a hops fan, so I may pass the cider review baton to my husband, who is. Here and here are two writeups which mention Tod Creek, from Cidercraft and Straight. UPDATE (Feb 22, 2016) – A friend gave me a can of this cider, as she remembered me saying I liked it, and she didn’t. Its quite unusual she also stumbled upon some as its still not available in the U.S. (although she works in the industry). This batch was quite different, and unfortunately I didn’t like it nearly as much. Although the citrus notes were there, it was drier (between dry & semi-dry), a bit more bitter, and a bit more tart. A good reminder that it is common in craft cider to sometimes have large differences batch to batch, year to year, despite trying to keep all the variables the same. Since this review I have a new favorite canned craft cider, Cascadia Ciderworkers United Dry, and have also found more multipack craft ciders I enjoy (like Rev Nat’s Revival and Celt). Have you tried any cider from Tod Creek? What did you think?